Thanks to Tracy stepping up and telling her story for RareDisease Day 2015, Trimethylaminuria was represented in this event. We thank you, Tracy, for your contribution to our cause. Rare Disease Day 2015 was our biggest and most impactful yet! 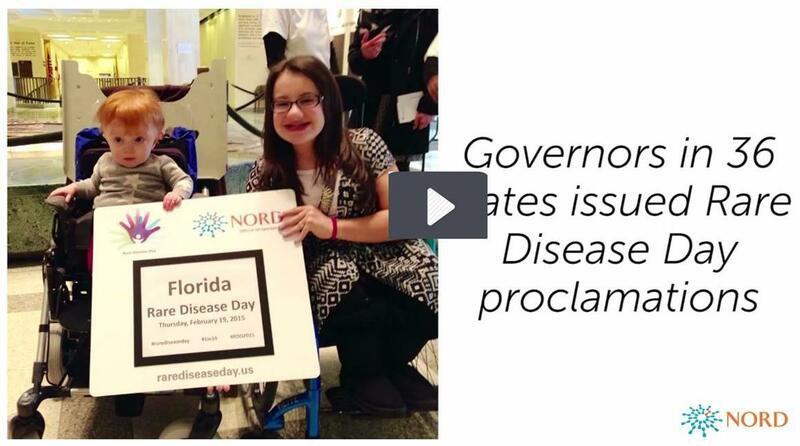 Governors in 36 states issued proclamations for "Rare Disease Day"
The Senate passed a resolution declaring Feb. 28, 2015 "Rare Disease Day"
With all of our efforts, Rare Disease Day continues to grow! Thank you to everyone who planned and attended events, joined the social media campaign, changed their profile photos, shared infographics, and got involved. As the official U.S. sponsor of Rare Disease Day, NORD thanks everyone who came together to support this truly community and group effort. Together, we are strong! You can help keep the positive Rare Disease Day momentum going by urging your representatives to support the Ensuring Access to Clinical Trials Act. This bipartisan legislation would help more people with rare diseases participate in clinical trials without fear of losing important benefits or health coverage. Learn more & take action as easily as entering your zip code. Planning is already underway! So far, 27 states have committed to hosting State House Events. Join us and get involved - send us an email and visit thewebsite in the coming months. Rare Disease Day 2016 will take place on Feb. 29, 2016, the rarest of all calendar days.